Several years ago, Colleen Sorenson fell under the spell of a colorful, compact neighborhood of homes, Colonia Guadalupe, increasingly attracting artists priced out of the center of San Miguel de Allende. She loves it but began to be alarmed by some of what she saw surfacing on buildings all around her. Tagged walls and graffiti attacks on property without permission damage the fabric of a neighborhood. But Colleen had seen this before in San Antonio, and she knew there were remedies. She was determined to corral the talent behind some of those marred walls, redirecting taggers toward more positive forms of artistic expression. The gringa transplant with little command of Spanish has made a huge impact on her adopted home in an extremely short time. And, whether working class or artist, everyone on every corner in Colonia Guadalupe seems to know her name. Some of the results of her efforts, both grassroots and at city hall, will be seen in a series of forthcoming posts. The harem’s full, but I don’t mind. Wonder what the older girls think when the Mister introduces a new one into the harem, watching as he lovingly caresses the curves of the latest arrival. Not one of them has been a part of his life for more than 20 years, except for one with such a wimpy, wispy voice he rarely touches her. No electric sparks fly through her veins. The flaming red-haired Gibson girl always thought she was his favorite, even after he brought in the skinny, slender-hipped, bleached-blonde. But then came the gaudy one from Austin with a gypsy-sounding name wearing all that turquoise. The Gibson girl was confident she could triumph over the tackily clad Mother-of-Toilet-Seat one who likes to lazily lay across his lap, but that turquoise tart? The gypsy thought she won his heart, but his love was fleeting. The room is so crowded; yet he found a way to squeeze in one more. This one, like the gypsy, is young. 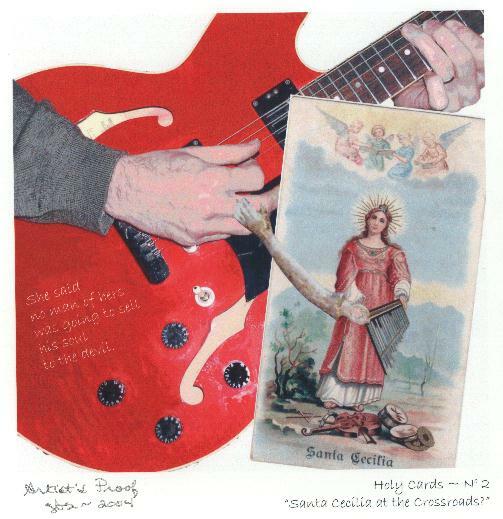 The child of guitar-maker Chuck Thornton belonged to Jay Wright, who broke her in, then struggled to part with her. Wright loved her so much, he almost made her a cover girl before letting her go. When the Mister snapped her up on eBay, Wright wrote to him gushing about her attributes and telling him how lucky he was to have her. 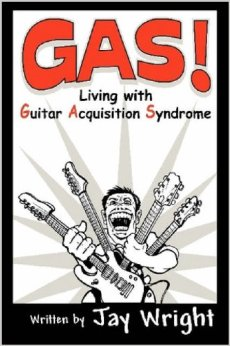 Wright also sent the Mister the book he published about living with “G.A.S.,” or “Guitar Acquisition Syndrome,” an addictive affliction affecting many men who obsessively keep adding to their harems. Display your guitars in different rooms. Spread them out – to a bedroom corner for one, beside a TV or piece of furniture in another room, in a closet, or under a bed. A herd never looks as large dispersed as it does clustered together in one room. The Mister needs no excuses. Someone married to a writer needs a major outlet of their own. So how do I feel when the Mister’s in his lair and I overhear him making one of his girls sing, even scream, loudly? Hey, I’m upstairs tapping away on my keyboard humming along. Some men get new wives when they turn 40; all I want is an electric guitar. Okay, that was an understatement. He wanted more than that first redhead. But no need to hide or thin out the herd. Surely the space in that music room is maxed out by now…. And, if I did object? And visit the After Midnight Blues Band at www.bluesinsanantonio.net. This post needs a soundtrack. Nothing would be more fitting than San Antonio high school students belting out mariachi music, so please play this while you read. For Jimmie. 1968. I think James Miller Draper, Jr., was there when the Paseo del Rio Association started, raising his hand to volunteer to do whatever it took to get attention for the River Walk. It might be hard to imagine now, but the few businesses opening along the river were desperate. There were times when the only live things walking down the sidewalk in the heart of the river bend were pigeons. Things were so dull, there was even a night when some bored unnamed river operators shot fish. With guns. Jimmie served as president of Paseo del Rio Association twice, in 1975 and 1984. But assumption of that responsibility is minor compared to his continual presence through thick and thin for more than four decades. The coldest mornings in December always were the Fridays we placed luminarias along the river’s banks. Bob Buchanan made the coffee, and Jimmie brought the doughnuts. Without fail. For decades. Nancy Hunt, current executive director of Paseo del Rio Association, said that even last year Jimmie rode the bus downtown to deliver sweets to those delivering bags to the river’s banks. No weather forecaster was more accurate than the first night of the annual Great Country River Festival the first weekend in February. Guaranteed sleet. Jimmie was always there. The event closest to his heart always, though, was the Fiesta Mariachi Festival. It was his. I believe he was the first and only chair of the festival for more than 40 years. He threatened to retire one year. Paseo even threw him a party to recognize chairing the event 25 years or so. That just made him sentimental and mushy about the whole thing, so he kept coming back. Every year, he gave up four nights of Fiesta to meet the high school students boarding the barges. Without fail. Until this past year. Being 86 is a pretty good excuse for easing up a bit. Generally Jimmie had the patience of Job. The time he really lost it, although not publicly, was at City Hall. The Paseo’s contract with the city in the late ’70s required we continually appear before Council to request approval for each event. It should have been routine, but poor Mayor Lila Cockrell had a rather rowdy bunch to try to keep corralled. Those were colorful times. I could almost see the hairs on the back of Jimmie’s neck bristle as a councilman went off on a rant about gringos being in charge of putting on a mariachi festival. Councilman Bernardo Eureste leapt to his feet and challenged Councilman Webb to duke it out. The scuffling councilmen went out in the hall to settle things, but were restrained before striking any serious blows. Permission to stage the admission-free festival was granted, but, on the way out of City Hall, Jimmie said that was it. He would never go back there and be insulted like that again. But he kept on volunteering again and again and again. Rain, shine, sleet, heat. No matter. Gringo Jimmie might not have been known for shouting loud gritos in public, but, in those early years working with Belle San Miguel, his belief in bolstering the talents of young musicians gave fledgling programs in public schools a stage on which to shine. Before there were statewide competitions, the Mariachi Festival was the event inspiring students to strive for professionalism in their performances. Jimmie loved to see students board the barges, proudly wearing their festival medals from each year they had participated. This spring will bring the 44th annual Fiesta Mariachi Festival. Jimmie was there for 42. Light a luminaria for Jimmie this holiday season. If it goes up in flame, it’s his unselfish and generous soul flying up to heaven.